What Are You Watching? is a weekly space for The A.V Club’s staff and readers to share their thoughts, observations, and opinions on film and TV. Pardon me for sneaking a Memory Wipe into this space, but I recently found myself wondering if The Life & Times Of Tim was as good as I remember. 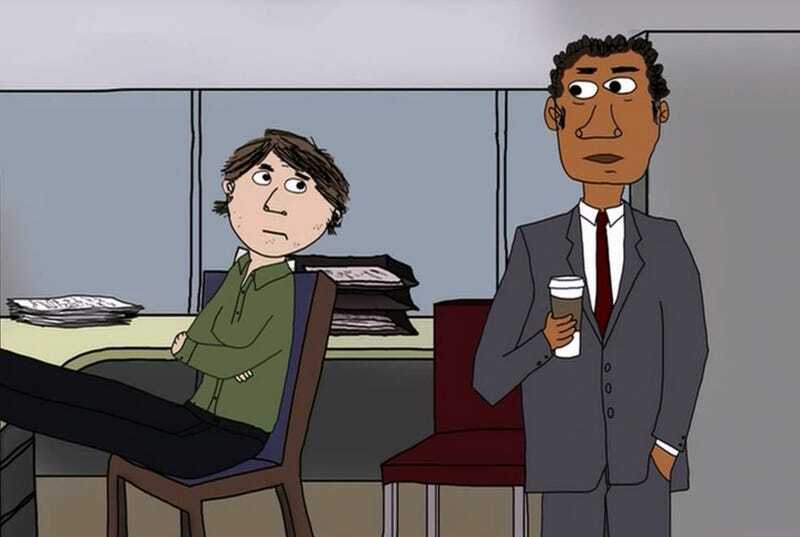 I watched Steve Dildarian’s short-lived animated comedy during its original run on HBO, and thought it was a great companion to The Office, which also featured a hapless everyman, a grandstanding but incompetent boss, and an increasingly cynical human resources rep. The Life & Times Of Tim also had a lot in common with its network peer, Curb Your Enthusiasm, in that their creators never found a mundane situation they couldn’t turn into life-or-death circumstances. (A different reviewer for this site previously described the show as a mix of Seinfeld and Office Space, which also feels apt.) At least, that was my recollection—and after rewatching much of the second and third seasons, I’m happy to report my memory isn’t far off. HBO’s never lacked for series about twenty- or thirtysomethings finding their way in the big city (which is more often than not New York), or comedies where things go horribly wrong, both territories covered by The Life & Times Of Tim. But when the show premiered in September 2008, it was the first one the premium-cable network had picked up since Todd McFarlane’s Spawn wrapped in 1999. When Tim ended in 2012 (for the second time), it was another four years before HBO debuted the Duplass brothers’ animated Animals. That’s no reflection of the show’s quality, though the first season’s a bit rough, with lulls between gags that are disproportionately long, especially given the 12-minute runtime. By the second season, Dildarian and his writers, including co-star Nick Kroll, had nailed the rhythm, chasing seemingly innocuous requests with disaster, then quickly resetting for the next burst of absurdity. The plainly-sketched animation was in a style similar to Home Movies and Dr. Katz, Professional Therapist. Episodes aired back to back on Sunday nights, kicking off with premises as superficially ordinary as the protagonist before devolving into bacchanals or international incidents (there was rarely a middle ground). The show follows Tim (Dildarian), a rudderless 25-year-old who’s in a typically—for a sitcom—improbable relationship with the beautiful, ambitious Amy (Mary Jane Otto). He holds down a vague job at the vaguely named Omnicorp, where he works with his friends Stu (Nick Kroll) and Rodney (Matt Johnson). He’s as likable as Jim Halpert, but nowhere near as capable, which means that all of his efforts at professional advancement end in catastrophe, for himself and anyone in his proximity. His boss—voiced by Peter Giles and usually referred to as The Boss, even by himself—doesn’t help Tim move up the corporate ladder so much as place him in a maze like a mouse, one who has to take responsibility for pooping in the elevator. Tim also shares the luck—and occasionally, disposition—of Curb’s protagonist, which means he bungles most social interactions. An early episode sees him enthralled by a “cool” priest (Rick Gomez), which leads to him “jokingly” objecting to Amy sister’s wedding. But he has no one to blame but himself when he’s caught fondling Amy’s grandmother, or when he charges $185,000 to his corporate card and ends up forfeiting his salary for two years (well, maybe some of the fault there goes to the hostage taker). And just like Larry, Tim’s attempts at good deeds frequently lead to ruin. Though The Life & Times Of Tim never featured anyone was sublimely profane as Susie Essman, it did wrangle nearly as many top-notch guest stars as Curb. Jon Daly, Andy Daly, Missi Pyle, Rachael Harris, Jennifer Coolidge, Melanie Lynskey, Bob Odenkirk, Chris Parnell, Jason Mantzoukas... the list goes on. The core cast more than held its own, though, but it’s Dildarian’s deadpan delivery that really sells the bizarre departures and borderline jokes. As the bemused figure at the center of growing chaos, Tim cuts a sympathetic figure. But the writing makes it clear that he’s every bit as complicit as his scheming boss, co-workers, and anyone else he has the misfortune of meeting (it always ends badly).